If you’ve had enough of stunning graphics and multiple bonus features then it may be time to remind yourself of a simpler time when three reels were the norm and pressing the ‘Spin’ button was all you had to worry about. Wowpot is an online slot from Microgaming which transports us back to those days but it does also offer a progressive jackpot for fans of the big wins. Wowpot is a three reel slot with two rows and just the single payline; everything is squeezed on a single screen and so the reels occupy the upper left portion with the paytable information on the right hand side. 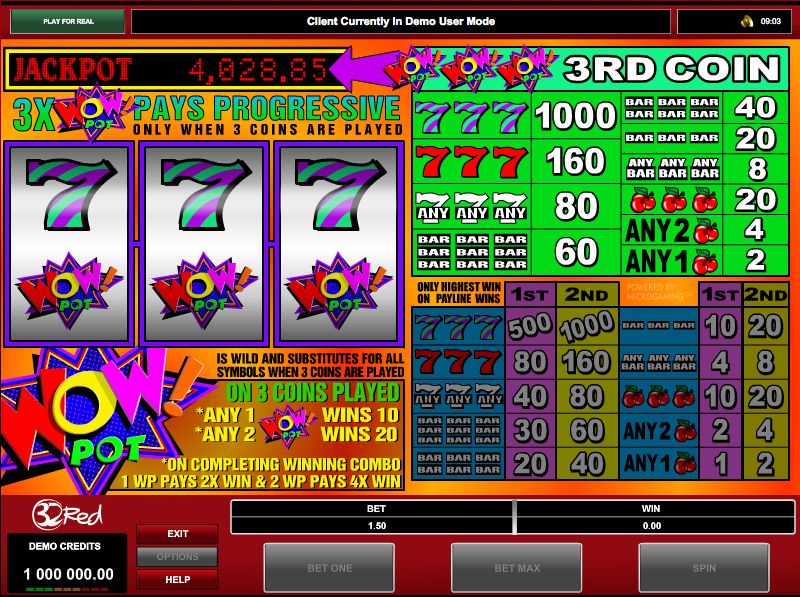 The progressive jackpot total can be seen ticking slowly upwards above the reels. Symbols are of the simplest variety and include cherries, single/double/triple bars and red/stripey sevens. There’s also a Wowpot logo which acts as a wild symbol. One or two cherries will return 2x or 4x your stake respectively, mixed bars returns 8x your stake and mixed sevens 80x. The Wowpot logo acts as a wild symbol so one contributing to a winning combo will double that win and two will multiply it by four. However the symbol only becomes wild when you are playing at the maximum coin level (three coins). We come for the gameplay but we stay for the progressive jackpot and that ever-increasing total above the reels is a glimpse of what we could win if the symbols line up correctly. To win this sum you will once again need to be playing at the three coin level after which you must land three Wowpot symbols on the payline. Wowpot is a nice simple example of a three reels slot with the added bonus of a progressive jackpot; that sum might not be the biggest but it’s well worth winning. RTP is scarily low at 89.63%.